Renowned naval architects Morrelli and Melvin lead the design team, built by Hudson Yacht Group at its state-of-the-art production facility in Xiamen, China, we invite you to visit the facility during the build. We know you will be more than impressed with both the build process and the exceptioonal finishes. 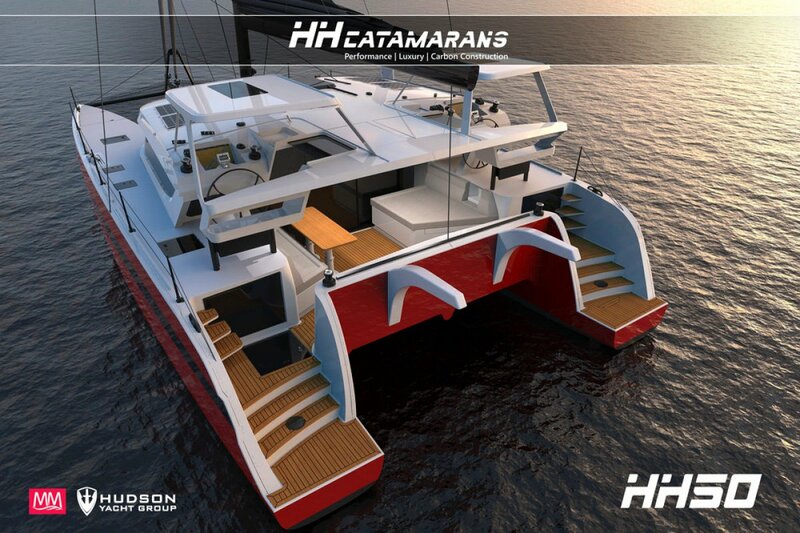 The HH50 fills a void in the semi-custom high performance catamaran market - a robustly built, blue water capable, fast cruiser with intelligent yet simple systems ideally suited for the short handed sailing, The 50 adhere's to HH Catamarans' core philosophies: Advanced design, lightweight construction and luxurious finish, but aim's to reach a slightly different audience. 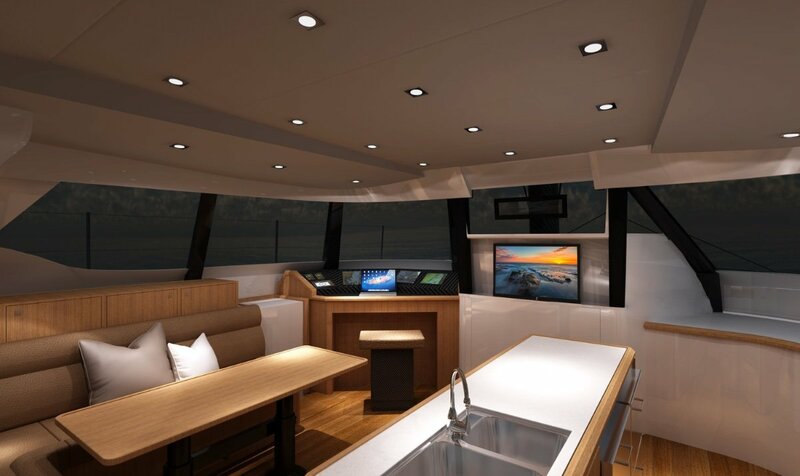 For the sailor who's serious about safety, speed, comfort, technology and style, the HH50 will take you around the world, in comfort and style with more than a hint of speed. Deck layout and sailing systems have been designed for short-handed sailing. Dual helm stations aft provide excellent visibility and allow the helmsman total sail control from either side of the boat. Push button mainsheet and self-tacking jib are standard. For those who wish to optimize performance, a powerful 520 sqft overlapping screecher is optional. All line handling is done from the helm stations opening up the rest of the boat for living space. 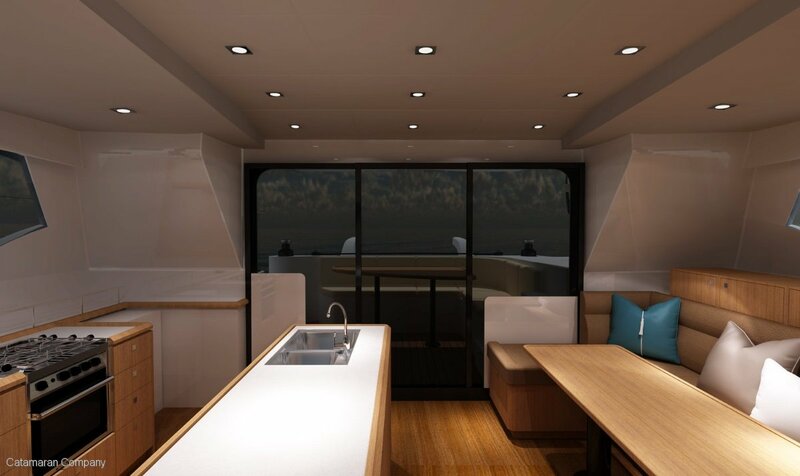 Future development will provide a new deck and interior layout allowing for the option of a forward helm station, a popular option which allows for total boat operation from the safety and comfort of the saloon. Like in the larger HH models, the HH50 will have curved "C" daggerboards with optional push-button controlled line drivers. Fully retracted boards will yield a draft of 2.25 ft (0.68m), allowing the boat to comfortably navigate shallow waters. HH Carbon Fibre- foam composite including carbon rig, carbon dagger boards and carbon sails. 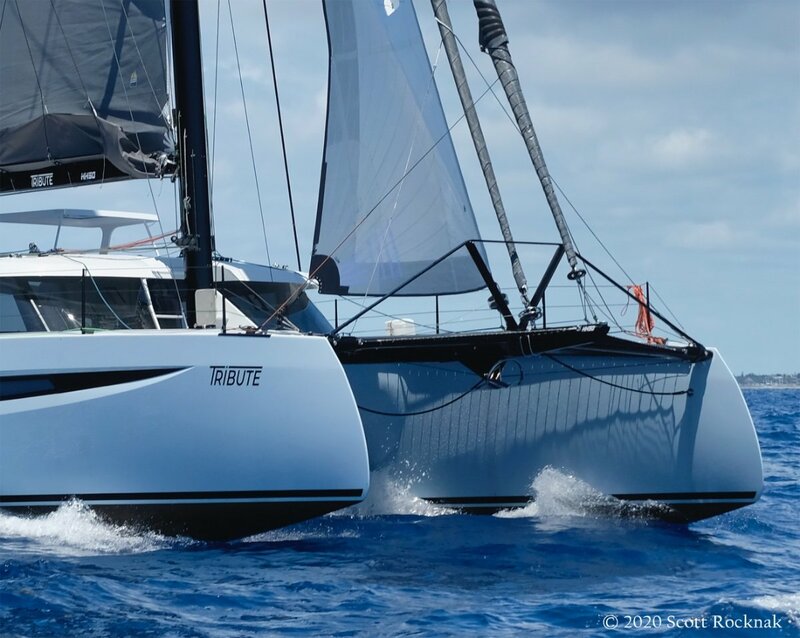 O. C. (Ocean Class) E- Glass foam composite, aluminium spars, performance mini keels, performance sails.. Substiantially more affordable than the all carbon version. * Large opening companion way door linking interior salon and the aft deck for indoor/outdoor living. 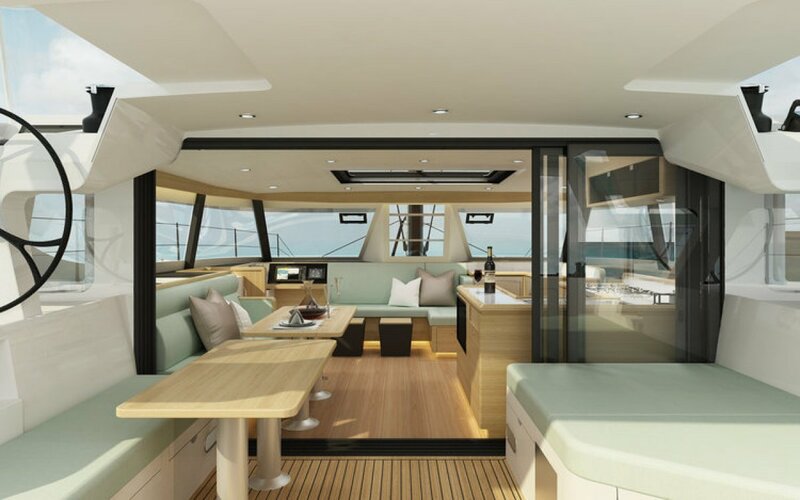 * The aft cockpit and salon seating and table can be linked together to form one large dining table. 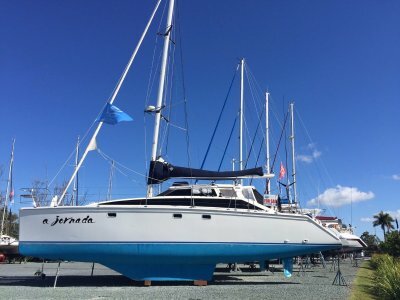 * Standard boat comes with queen berth and twin bunks in starboard hull, port hull is dedicated owners suite abundant storage, full height wardrobes, dedicated head and shower. 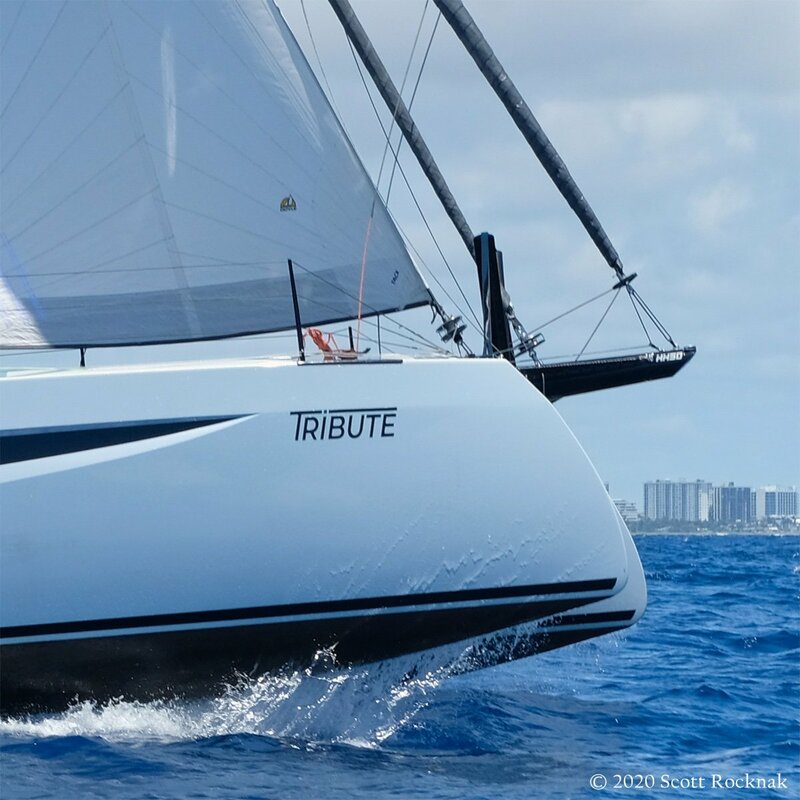 * Centralized helm station allows for easy single-handed sailing. * All sail control lines from the mast lead to the forward cockpit. * Anchor rodes: 61m of 10mm SS chain with 23m of nylon rode. * Anchor bridle attached to cross-beam chain plate. * 2 x 6 man SOLAS life rafts incl. SOLAS survival package. * 3x ZEUS3 9" Multi-function touch screen display, With Insight charts. Two at helm and one at Nav station. * Triton. Speed / Depth / Wind pack. Contains Triton. 4.1Inch color display, DST800 transducer 508 wind sensor and NMEA2000 ship wide systems. * The ZG100 Antenna with built in rate compass provides high accuracy position at a 10Hz update rate. The built in rate compass is perfect for providing heading data for Radar Chart Overlay and for orientating charts in Head Up Mode. * Functionality and Smart Maneuver controls. * NAC-3 Autopilot Core Pack: Comprising of the high-current NAC-3 autopilot computer, Precision-9 compass and RF-25 rudder feedback unit. 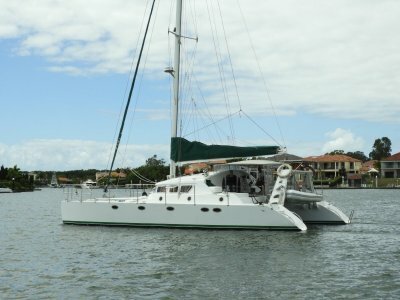 * HH50 standard sail packages includes three sails. 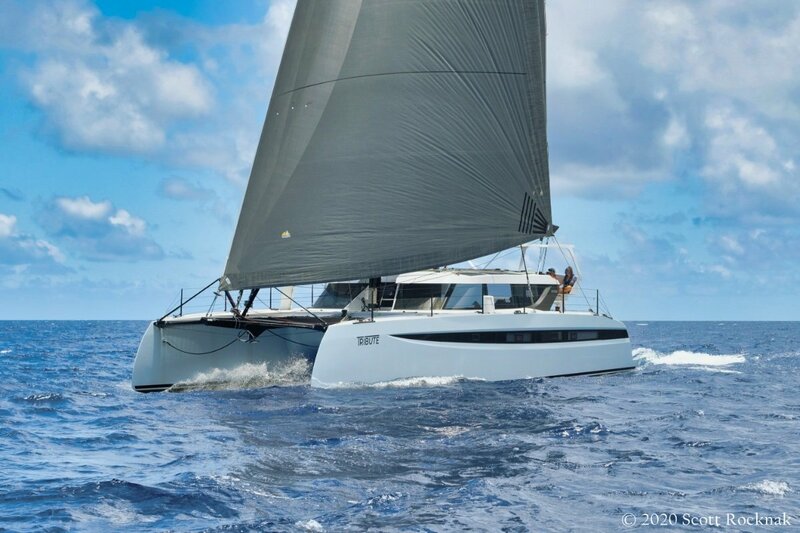 * Pin top Mainsail - 2 reefs, crosscut Dacron construction using durable Challenge High premium range Dacron. Including vinylester battens and standard m12 batten receptacles. * Self-Tacking Jib - Crosscut Dacron construction using Challenge High Premium range Dacron. Includes UV to leech and foot. * Reacher- Radial Dacron construction using Challenge 3.8oz, includes anti-twist furling stay. * Aluminum fractional non-rotating mast (C365 section). * Black painted anodized aluminum extrusion for slab reefing. * Aluminum mast step, rocker style to avoid variation in fore/aft mast rake and athwart ship shroud stretch. * Halyards and control lines lead to the forward cockpit. 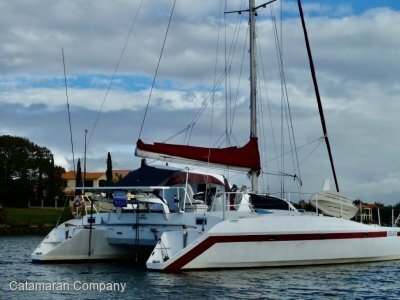 * Selden track battcar system for fat head mainsail (35% headboard) with detachable headboard to enable easy lowering into stack pack. * Halyard control lines led to forward cockpit winches. * Furling lines lead to forward cockpit winches. * Sail control lines led to forward cockpit winches. * Cunningham and reef lines run to forward cockpit. * Self-tacker sheet run to forward cockpit. * Reacher furler line (1) lead to forward cockpit winch. * Jib furler line (1) lead to forward cockpit winch. * Single line davit system, controlled by single aft beam winch. * 2x aluminum 2 speed Lewmar Evo Race+ 55 self-tailing alloy winches or equivalent in forward cockpit. These winches are lightweight and include carbon 'bling' on top. * 1 x aluminium 2 speed Lewmar Evo30 self-tailing alloy winch on aft beam for davit control. * All lines lead to forward cockpit. * Reacher sheet system consists of: 2 x Lewmar blocks & 2x Lewmar padeyes, lines lead fwd. * Mast base blocks, Lewmar, on soft loops. * Forward trampolines, lashed individually every 150mm for maximum safety to hull, longeron and cross beam. Choice of forward internal helm and cockpit or twin steering stations aft. 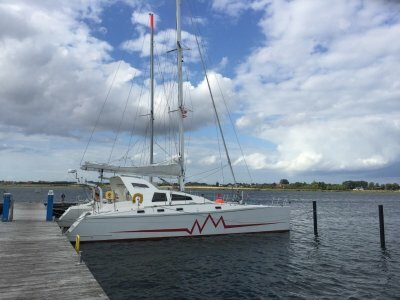 Looking for a go anywhere, fast passagemaker that is easy to handle and very comfortable to live aboard? CONTACT US here at our waterfront office opposite the Cafe Restaurant at the Boat Works Coomera, Queensland to discuss your interest in the HH50 or her bigger sisters the HH55 and 66. Phone (07) 5502 3124.